1940s: What Happened to Missing Pat Jolly Batchelor? Is There a Connection Between Kent Robertson’s Eeerie Find at Grey Whale Cove and the Memories of Ron Batchelor? The Gray Whale Cove Mystery began in October 2007, with this intriguing email from Ken Robertson, who had begun working for the State Parks. I had never been down the stairs to the beach. Just wanting to see what the bottom of the stairs looked like I ventured down. Just before the bottom and right over the large culvert there, I looked back up the cut towards the highway and found a trail had been worn half way up, ending at this headstone (being October and so close to Halloween, I thought it might have been a plastic replica that had gotten away, but the trail was obviously to well worn for that). Closer inspection proved that it was a cement and rebar creation (the cement had come away from its base, revealing two pieces of rebar supporting the rest), with a brass center plate that either had a name and epitaph attached or inscribed, but was now smooth. I figured it was a relic of the WWII era, but wonder if you know just who is buried there. I am surprised how many of my coworkers are unaware of its existence and no one has any idea of who might be there. I did not know anything about the “marker,” had never seen it, or heard anyone talk about it before Ken enlightened me. I posted Ken’s message, hoping that someone “out there” had information. Time passed, and yesterday I received an extraordinary email from Ron Batchelor. 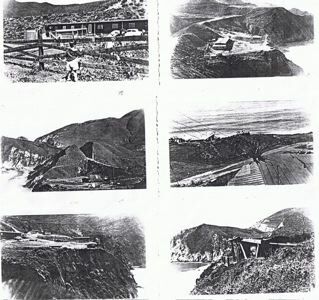 Ron had lived with his family at Grey Whale Cove–in a house that no longer exists. Hi June, that could be the grave site of my fathers 4th wife, missing Pat Jolly Batchelor, some time in the late 1940’s. I would have not put it past my father to mark the grave site this way. We lived on the flat 5 acre parcel with a beach next to the gun battery, in the early 1950’s there were 3 homes on the property. I was born in 1951 and my father sold the land 7 years to the day later, that Pat Jolly had gone missing and was never found. 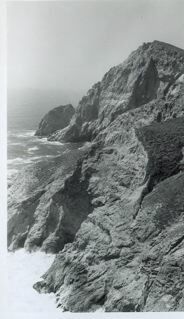 Grey Whale Cove had also been known as Match Book Cove for all the match books that Pat Jolly saved. My father drove my mother away by trying to kill her several times, as my mom told me. When my mom was going thru the divorce my dad Robert Batchelor sold the land and split, we never saw him again, the land was in his name only, no money no child support no nothing. I was about 4 or 5 when this happened. My father died in 1977 and my mother in 1998 My father took a lie detector test and passed. He also did one other thing that was noted in the Pat Jolly case, he had the air pressure checked of the spare tire in the trunk of his car just as Pat Jolly went missing and before the trip to Texas that he took. He proved that Pat was not in the trunk. How many men have the spare tire pressure checked? These things are from what my mom told me as I was growing up. My dad also did one other thing once a year and that was to take a hike to some spot and then go back home as if to check on something as my mom put it. So if the remains are of a woman it could be my dad’s 4th wife. 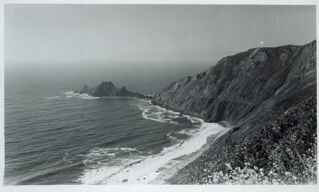 I grew up on the coast lived in Montara most of my childhood, and graduated in 1969 from Half Moon Bay High School. Me, I am Ron Batchelor, I now live in Arizona with my wife of 37 years. I still love the coast and return for all class reunions hers and mine. WITH ALL THE CONSTRUCTION WORK GOING ON AT THE NEARBY TUNNEL– it’s imperative to check the site out at once, just to be certain that there is not a body buried there.